Since the announcement of Hong Kong collectible toy company's ambitious new Movie Masterpiece Diecast line of figures – figures that use actual metal parts – I've spent countless hours oogling over the images of the Iron Man 3 Mark XLII suit. I almost immediately preordered the figure, and now, a year later and after several delays here it finally is. Was it worth the wait? The Box First off, the box itself is damn spiffy. The thing feels sturdy, hefty and damn impressive. From the overlapping Iron Man image on the outside, to the laser cut styrofoam box inside, the whole thing fits together in a sharp package that carries the whole "Iron Man" theme right in its design. It took me a while of marveling before I could even open the box to the goodies inside. Metal The figure looks and feels great. It's probably due to the use of actual metal in the armor itself, but this is by far the best looking Iron Man figure I have ever seen. The figure has a weight to its presence that makes it look more real and altogether more awesome. Put plainly: The Mark XLII just looks amazing. Ar-tic-u-la-tion One problem with these figures in the past is the restrictions in movement of the figure and consequently the poses you can have the figure make. Hot Toys has long been trying to find creative ways to work around the movement limitations with each new figure that comes out, and with Mark XLII it seems damn near perfect. The shoulders pop out for a little bit of extra movement in the arms, the legs have a hinge area that slides out to allow the figure's legs to bend further than they normally would. It's not 100% – you can't make the figure pose in the "three-point landing" position – but it's definitely an A+ for effort and ingenuity on the part of Hot Toys. Batteries Included One of the gimmicks in every Hot Toys Iron Man armor figure that comes out is the LEDs in the chest arc reactor, the hand repulsors and the eyes that light up. For the Mark XLII, the batteries for said light-up gimmicks have been included in a separate package so you can insert them as you please. This is a godsend for collectors who don't like having their figures come with the batteries already inserted where they will deplete and/or corrode over time. While actually installing the batteries takes some nimble fingers, this little gesture on the part of the makers was much appreciated. Headlights Hot Toys is constantly designing and redesigning their figures, and an obvious evolution can be seen from figure to figure. However, not all redesigns are for the best, and the location of the switch to light up the Mark XLII's eyes seems a bit of a step backwards in comparison with the previous Mark VII armor. To access the switch for the Mark XLII, you have to remove the face plate as well as the top of the helmet that serves as the battery cover. It's a small thing, but it feels like an unnecessary task and a flaw when you compare it to what's come before. Semi-Battle-Damage The interchangeable battle-damaged parts would be cool if they weren't so limited. As it is, the Mark XLII comes with a battle-damaged head, a chest piece, a right upper arm, left and right forearms, shoulders, wrist guards, and that's it. The rest of the body remains sparkly clean, making the limited battle damage limited to the upper body and seem almost awkward in comparison. Especially in contrast with the non-damaged areas. At the very least, some interchangeable leg armor would have added to the overall battle-damaged look of the figure. The Rumors From what I have heard, some people who have gotten the figure have encountered problems with shoulder joint breakage. My Mark XLII has no such issues, but the fact that there are defective figures out there is a bit of a disappointment. While I may have noted some negative points, make no mistake, the Diecast Movie Masterpiece Mark XLII is my all-time favorite Hot Toys figure, ever. The look and feel of the real metal places it head and shoulders above any other Iron Man figure I have ever seen. While the one year wait was a little tough – especially watching other figures that were announced after it come out first – seeing all the effort and detail that was put into making this figure so awesome make it all worth it. Hell, there are even heat burns on the back from the exhaust ports I never realized were there. If you like the Iron Man 3 movie – Hell, even if you hated the movie (and I know some of you are out there), this figure is hands down the best Iron Man armor figure, even with the hefty price tag. For me, not only is the figure damn cool on its own, but it totally completes my Tony Stark (Workshop Version) that has been missing its Pièce de résistance for the past year. 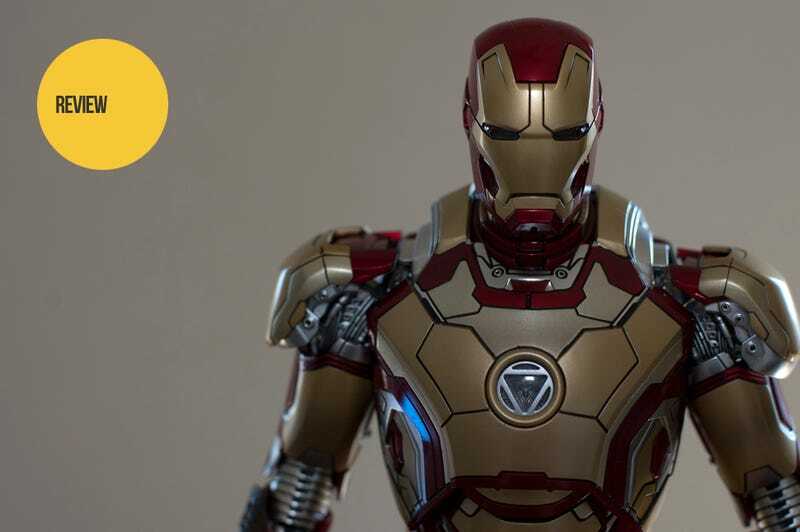 The Hot Toys Iron Man Mark XLII is currently sold in the West through Sideshow Collectibles. As of this article, the figure is on pre-order.